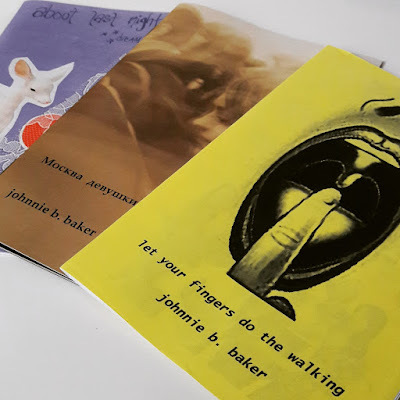 Budget Press is a no nonsense small press run by johnnie b. baker out of California. I first encountered the press when johnnie submitted a short story to my own zine (Paper and Ink Literary Zine), which went on to feature in the eighth issue. I have been following the press ever since and recently bought a copy of johnnie's zine 'Let Your Fingers Do The Walking', and he was kind enough to also send me some other zines that he had recently published, 'Москва девушки' a photography zine, also his own, and 'About Last Night: A Dream Zine' by Robyn Joy. These zines are old school, lo-fi, cut and paste publications. In a world where zines seem to be getting more and more artisanal and pretentious; expensive paper stocks, fancy binding and embossed typography etc, it is refreshing to see these zines made the traditional way. 'Let Your Fingers Do The Walking' tells the true story of johnnie's battle with an eating disorder in his younger days (or in his own words: "a little true story about being a fat kid on drugs with an eating disorder whose guts eventually explode. Yay!"). It is important that these stories are told, and especially by men, as people often forget that it is not just women that suffer from body image issues, and they can spiral out of control if they are not addressed properly. Hopefully the tale of johnnie's exploding guts will be enough to prompt any young men that are facing similar issues to seek help ASAP. 'Москва девушки' is a zine of photographs "taken without looking", which is a very interesting concept and provides a candid collection of shots of people going about their day to day lives. Most certainly a zine for the people watchers out there. And finally 'About Last Night' is a beautifully bright and colourful cut and paste zine by Robyn Joy - a collection of brief descriptions of her dreams, which span the years 2011 to 2015. Robyn's dreams range from incredibly dark and disturbing to lighthearted and whimsical. A very interesting read, which made me wish I had kept a diary of my own dreams throughout the years. Budget Press also has a number of other publications available, which are all very much worth your time and money, so please show your support by clicking the image below and buying some rad zines!